Bramble who dominated a 209-run third wicket stand with the gritty 22-year-old Tagenarine Chanderpaul to leave the home side in good position on 307-6. 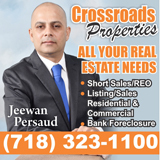 Chanderpaul, batted the entire day to remain unbeaten on a carefully constructed 71 from 293 balls, 263 minutes with four fours. With him is Romario Shepherd on 5 after pacer Josh Thomas took two wickets in three balls to finish the day with 3-63. Bramble, in his 52nd First-Class match since his debut against CCC in 2013, hit 17 fours and six sixes from 153 balls and 189 minutes and his brilliant innings took his aggregate to 290 runs. 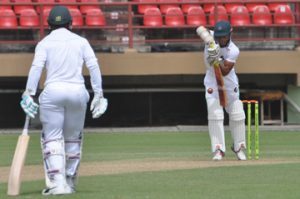 He shared in a partnership of 209 with Chanderpaul, they joined forces with the Jaguars in a spot of bother on 71-3 after the team won the toss and elected to bat on straw coloured track. 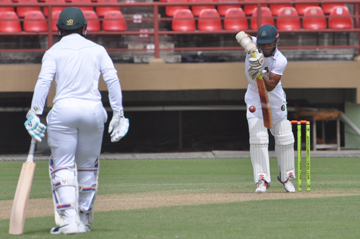 Trevon Griffith who stroked Shermon Lewis for four and spanked Josh Thomas past cover for his second boundary, was the aggressor in the partnership with Tagenarine Chanderpaul who his usual ultra-cautious self. A small crowd watched in hazy sunshine as Thomas broke the 22-run stand when he induced Griffith (14 from 17 balls) to edge one that left him to the Keeper. Skipper Leon Johnson (5) did not last long and after flicking Lewis for four, played a loose drive and was taken at gully, Lewis striking at 27-2 to bring the free flowing Shimron Hetmyer, the fourth left-hander, to the crease. Tagenarine Chanderpaul defends during his dogged innings yesterday. immaculately manicured outfield to the ropes before hitting Thomas for four. By lunch, the Jaguars were 70-2 with Hetmyer on 26 from 44 balls and Chanderpaul on 18 from 97 balls. After the interval the 22-year-old Hetmyer played a lose cut to Ray Jordon and was caught behind without adding to his lunch time score to leave the score on 71-3. Bramble drove Jordon back past his ankles for four before edging the 24-year-old Vincentian over the slip cordon for another boundary. 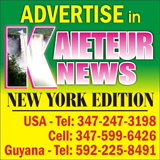 Chanderpaul, who made an unbeaten 84 when the Jaguars declared at 310-4 when these teams last met in St Lucia, continued to bat doggedly while Bramble with a century to his name in his last match in Barbados, flicked Lewis for four. 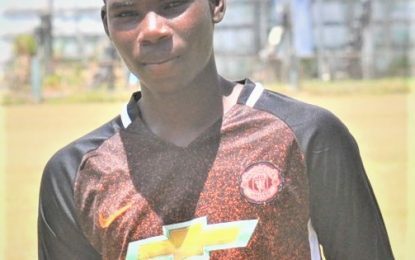 Bramble from Skeldon in Berbice smashed left-arm spinner Larry Edwards for contrasting boundaries; he pulled him to the mid-wicket boundary before finding the ropes with a blistering cover drive off the next ball. Anthony Bramble pulls during his pugnacious century yesterday at Providence. 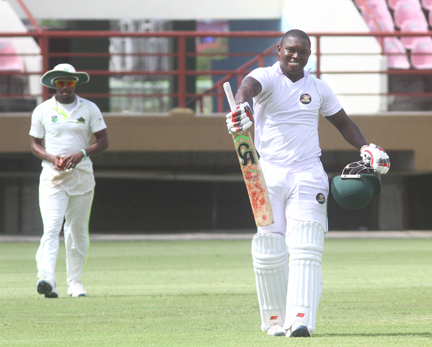 Kaveem Hodge was introduced in the 35th over and the in-form Bramble delightfully swept him for four to rush past Chanderpaul’s score. 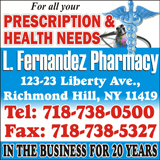 With cotton wool-like clouds floating lazily over the Providence sward and strong breeze blowing across the ground, Chanderpaul got himself bugged down as he failed to find the gaps or rotate the strike. 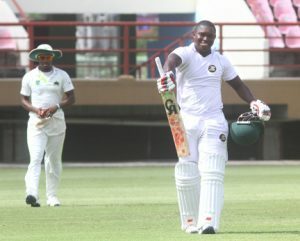 Bramble cut Edwards and hit him over cover to post his 50 from 52 balls, 61 minutes with eight four while the 100 partnership was posted in 23.4 overs with Bramble contributing 79 and Chanderpaul 18. 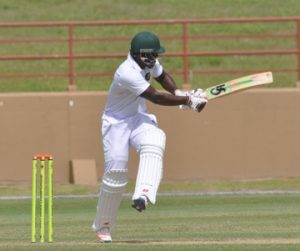 Hodge was pulled for a six and a four off consecutive balls before the on-fire Bramble dumped off-spinner Alick Athanaze for a couple off sixes to his reach his third ton and second in two matches. His 100 came from 84 balls, 97 minutes with 11 fours and four sixes and his second 50 came from just 32 balls. 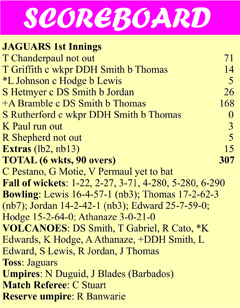 At Tea the Jaguars were 212-3 with Bramble on 113 and Chanderpaul on 43. Bramble continued to pounce on the bad balls, pulled Jordon for four and flicked him for another while Chanderpaul continued to be like a wall as the Bramble-dominated partnership. Chanderpaul, who executed several good shots that went straight to the fielders, finally found the gap when he square drove Hodge for a couple to move to 47 while Bramble savagely cut Thomas behind point and took a single off next ball to reach 150 from 131 balls,155 minutes with 16 fours and six sixes. Chanderpaul turned Thomas for two in the next over to reach his eighth fifty at this level. His marathon half century lasted 233 balls, 277 minutes with two fours. 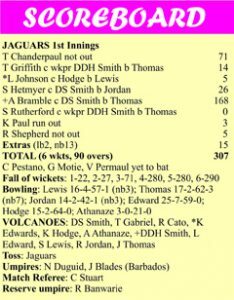 From 280-3 Jaguars slipped to 291-6 as Thomas struck twice by removing Bramble and Sherfane Rutherford (0) at 280, Kemo Paul (3) was run out. 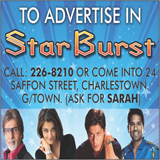 Shepherd joined Chanderpaul who displayed excellent temperament and saw their team to the close without further loss.